This year we can take a huge step in turning around the troubled Seattle School District, but to do so will require replacing the current board members that are up for election. (1) Multiple reports of financial irregularities, including an out of control Small Business Development Program that wasted 1.8 million dollars. (3) Lack of progress on student achievement, particularly by minority and low-income students. (4) Firing of a highly competent and beloved principal of Ingraham High School and an unwillingness to admit error over the incident. (5) Selling Martin Luther King Elementary to a group with inside connections, for a loss of near 7 million from what could have been secured from the Bush School. (6) Selection of a high school math curriculum found to be mathematically unsound by the State Board of education. (7) Deliberate deception about the college readiness of Seattle students. 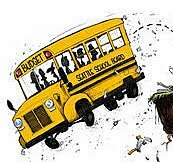 (9) The State Board of Auditors 2010 audit produced a highly damning audit of district finances, citing mismanagement of district resources and noted that the school board failed to properly oversee the superintendent. I could go on and on..but you get the message--poor student performance, poor administrative structures and oversight, cronyism, corruption, and much more. Ultimately, the Seattle School Board is responsible for the school district and it is clear they have not done a very good job. Many of them have been content with rubber-stamping the Superintendent's recommendations, have shown little curiosity about obvious failures, have provided minimal oversight, and have shown little interest in taking strong steps to turn around a sinking district. But the waterfall of failures have gotten the community's attention and the worst school directors are now up for reelection. Retiring the current incumbent directors up for reelection and replacing them with active, questioning individuals could have a huge impact. particularly since the remainder of the board is much stronger (DeBell, Patu, Kay Smith Blum) . If you are a Seattle voter, this year you can have a major impact for good--here are my suggestions. District 1: Sharon Peaslee over the incumbent Peter Maier. Maier is one of the worst of the current board members, and it is has been reported that he knew about some of the financial shenanigans early and chose not to act. He also voted for the terrible Discovering Math series, even after he was told it was unsound (I was there...he really didn't care). Sharon Peaslee has substantial teaching education and experience, was a key player in saving Ingrahm HS principle Martin Floe, and has been a real activist for better math and other issues. District 2: Kate Martin or Jack Whelan over the incumbent Sherry Carr. Sherry Carr has a lot in common with Peter Maier--lack of curiosity, lack of vision, stay the course, support the superintendent. Kate Martin has great vision, amazing knowledge about education, is willing to ask hard questions, and has the experience in management to back it up. And extraordinarily articulate. Jack Whelan, a member of the the Foster School of Business at the UW, is the poet of the campaign, writing cogently and insightfully about the districts problems. He will not rubber stamp. District 6: Marty McLaren over the incumbent Steve Sundquist. Steve was supporting Goodloe Johnson to the end and rarely questioned the Superintendent's direction. He STILL believes that the selection of poor Discovery math books was a good idea and has pushed the idea of bringing barely qualified Teach for America recruits into our classrooms. Amazing. Marty McClaren is an extraordinary individual, with substantial teaching experience and was the force behind the initially successful math textbook lawsuit, for which she took personal financial responsibility (one of the most selfless acts I have seen in a while). She is the kind of person that will ask questions...a lot of them. Folks...elect 2 or 3 of the above and the majority of the board will change from stay-the-course rubber stamp types to inquisitive, intelligent individuals ready to show considerable leadership.